This article is about the region in Europe. For other uses, see Livonia (disambiguation). 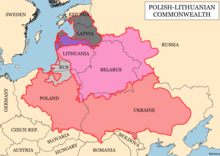 The Livonian Order was a largely autonomous branch of the Teutonic Knights (or Teutonic Order) and a member of the Livonian Confederation from 1418–1561. 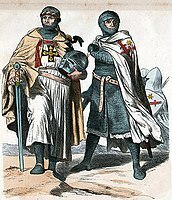 After being defeated by Lithuania in the 1236 Battle of Saule, the remnants of the Livonian Brothers of the Sword were incorporated into the Teutonic Knights as the Livonian Order in 1237. Between 1237 and 1290, the Livonian Order conquered all of Courland, Livonia, and Semigallia, but their attack on northern Russia was repelled in the Battle of Rakvere (1268). In 1346, after St. George's Night Uprising the Order bought the rest of Estonia from King Valdemar IV of Denmark. Life within the Order's territory is described in the Chronicle of Henry of Livonia and the Livonian Rhymed Chronicle. 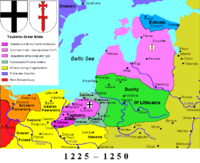 The Teutonic Order fell into decline following its defeat in the Battle of Grunwald in 1410 and the secularization of its Prussian territories by Albert of Brandenburg in 1525, but the Livonian Order managed to maintain an independent existence. During many years of Livonian War (1558–1582), however, they suffered a decisive defeat by troops of Muscovite Russia in the Battle of Ergeme in 1560 and continued living under great threat. Letters to the Emperor arrived from many European countries, warning, that Moscow has its eyes on much more than only a few harbors or the province of Liefland ... the East Sea (Ostsee-Baltic Sea and the West Sea (Atlantic) are equally in danger. Duke Barnim the Elder, 50 years duke of Pomerania, warned, that never before did he experience the fear than now, where even in his land, where people send by Moscow are everywhere. 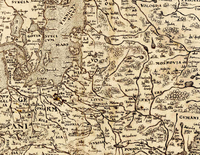 At stake was the Narva-Trade-Route and practically all trade in the North, and with that all of Europe. Due to religious upheavals of the Reformation the empire could not send troops, which it could not afford and which were too far away anyway. Prussia was not able to help for much of the same reason, and Duke Albrecht was under continuous ban by the emperor. The Hanseatic League was greatly weakened by this and the city state of Luebeck fought its last great war. The emperor Maximilian II diffused the greatest threat by remaining on friendly terms with the czar, but not sending him troops as requested, in his struggles with the Polish–Lithuanian Commonwealth. The Peace Party, however, had its own armed forces – scattered bands of household troops (Hofleute) under diverse command, which only united in action in 1565 (Battle of Pärnu, 1565 and Siege of Reval, 1565), in 1570–1571 (Siege of Reval, 1570-1571; 30 weeks), and in 1574–1576 (first on Sweden's side, then came the sale of Ösel–Wiek to the Danish Crown, and the loss of the territory to Tsardom of Russia). In 1575 after Muscovy attacked Danish claims in Livonia, Frederick II dropped out of the competition as well as the Holy Roman Emperor. After this Johan III held off on his pursuit for more land due to Muscovy obtaining lands that Sweden controlled. He used the next two years of truce to get in a better position. In 1578, he resumed the fight for not only Livonia, but also everywhere due to an understanding he made with Rzeczpospolita. In 1578 Magnus retired to Rzeczpospolita and his brother all but gave up the land in Livonia. Sweden was given roughly the same area as the former Duchy of Livonia after the 1626–1629 Polish–Swedish War. The area, usually known as Swedish Livonia, became a very important Swedish dominion, with Riga being the second largest Swedish city and Livonia paying for one third of the Swedish war costs. Sweden lost Swedish Livonia, Swedish Estonia and Ingria to the Russian Empire almost 100 years later, by the Capitulation of Estonia and Livonia in 1710 and the Treaty of Nystad in 1721. Ostland was one of the Reichskommissariats established, by a Decree of the Führer dated 17 July 1941, as administrative units of the "Großdeutsches Reich" (Greater Germany). The structure of the Reichskommissariats was defined by the same decree. Local administration in the Reichskommissariats was to be organized under a "National Director" (Reichskomissar) in Estonia, a "General Director" in Latvia and a "General Adviser" in Lithuania. The local administration of the Reichskommissariat Ostland was under Reichskomissar Hinrich Lohse. Below him there was an administrative hierarchy: a Generalkomissar led each Generalbezirke, Gebietskomissars and Hauptkommissars administered Kreigsbietes and Hauptgenbietes, respectively. Alfred Rosenberg's (Minister für die besetzten Ostgebiete (Reich Ministry for the Occupied Eastern Territories) ministerial authority was, in practice, severely limited. The first reason was that many of the practicalities were commanded elsewhere: the Wehrmacht and the SS managed the military and security aspects, Fritz Saukel (Reich Director of Labour) had control over manpower and working areas, Hermann Göring and Albert Speer had total management of economic aspects in the territories and the Reich postal service administered the East territories' postal services. These German central government interventions in the affairs of Ostland, overriding the appropriate ministries was known as "Sonderverwaltungen" (special administration). Later, from September, the civil administration that had been decreed in the previous July was actually set up. Lohse and, for that matter, Koch would not bow to his authority seeking to administer their territories with the independence and authority of gauleiters. on 1 April 1942 an arbeitsbereich (lit. "working sphere", a name for the party cadre organisation outside the reich proper) was established in the civil administration part of the occupied Soviet territories, whereupon Koch and Lohse gradually ceased communication with him, preferring to deal directly with Hitler through Martin Bormann and the party chancellery. In the process they also displaced all other actors including notably the SS, except in central Belarus where HSSPF Erich von dem Bach-Zelewsky had a special command encompassing both military and civil administration territories and engaged in "anti-partisan" atrocities. Chisholm, Hugh, ed. (1911). "Livonia" . Encyclopædia Britannica. 16 (11th ed.). Cambridge University Press. pp. 816–817. ^ "Letter by Pope Gregory IX". Archived from the original on 2007-08-14. . In Latin. Hosted by the National Archive of Finland. See "Archived copy". Archived from the original on 2007-06-08. Retrieved 2007-05-29. CS1 maint: Archived copy as title (link) and Diplomatarium Fennicum from the menu. ^ a b c Koch, Kristine (2002). Deutsch als Fremdsprache im Russland des 18. Jahrhunderts. Die Geschichte des Deutschen als Fremdsprache (in German). 1. Berlin/New York: Walter de Gruyter. p. 59. ISBN 3-11-017503-7. ^ a b Alfredas Bumblauskas (2005). Senosios Lietuvos istorija 1009 - 1795 (in Lithuanian). Vilnius: R. Paknio leidykla. pp. 256–259. ISBN 9986-830-89-3. ^ Robert Auty (1981). D. Obolensky, ed. Companion to Russian Studies: Volume 1 Vol 1 Introduction to Russian History. Cambridge: Cambridge University Press. p. 101. ISBN 0-521-28038-9. ^ a b c Szilvia Rédey, Endre Bojtár (1999). Foreword to the Past: a cultural history of the Baltic People. Central European University Press. p. 172. ISBN 963-9116-42-4. ^ Norman Davies (1996). Europe: a History. Oxford: Oxford University Press. p. 555. ISBN 0-19-820171-0. ^ George Miller (1832). "Modern History". History, philosophically issustrated, from the fall of the Roman empire to the French revolution. p. 258. ^ Alfrēds Bīlmanis (1945). Baltic Essays. The Latvian Legation. pp. 69–80. OCLC 1535884. ^ Beresford James Kidd (1933). The Counter-reformation, 1550–1600. Society for promoting Christian knowledge. p. 121. Look up livonia in Wiktionary, the free dictionary.